Even today, Thirty Mile Point Lighthouse is quite isolated, being some distance from any major port or city. 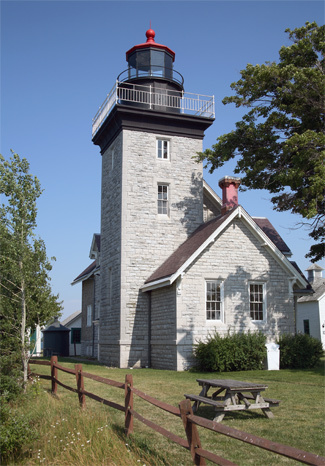 This is because the lighthouse wasn’t built to guide mariners to a safe harbor, but rather as a coastal light, warning mariners of shoals and guiding them along this portion of Lake Ontario. Prior to the establishment of the lighthouse, at least four ships had sunk near Thirty Mile Point, including one belonging to the French explorer LaSalle in 1678. The most tragic loss appears to be the eighty-foot schooner H.M.S. Ontario. Built in 1780 during the Revolutionary War, the vessel was the largest British warship on the Great Lakes at the time. Just a few months after its launch, the Ontario departed Fort Niagara for Montreal, carrying eighty-eight passengers, including Lt. Colonel Bolton former commander of the fort, and an army payroll of $15,000 in gold and silver. The Ontario foundered off Thirty Mile Point in a Halloween blizzard. There were no survivors. Another name for the area around Thirty Mile Point is Golden Hill. In 1834, a local farmer named Daniel Cartwright was herding cattle along the creek that empties into the lake near Thirty Mile Point, when he saw men row ashore from an anchored ship and unearth a chest from the creek bank. The secreted bounty, believed by Cartwright to be gold buried by the survivors of a shipwreck, was carried back to the ship, where the men raised anchor and sailed off. Based on this tale, treasure hunters have dug along the creek in search of more hidden gold. Despite this incident, the more probable origin of the name Golden Hill, found on early French maps, is a one-acre island, covered with goldenrod blossoms during the summer, which once existed at the mouth of the creek. 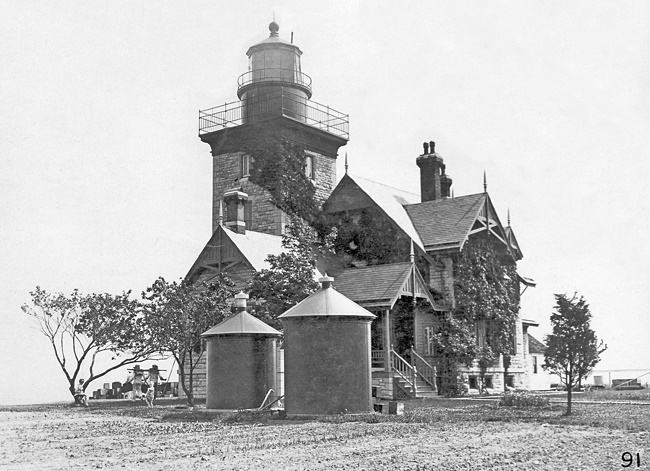 In 1872, the Lighthouse Board recommended “that a lake-coast light be established near the point where the boundary line between Niagara and Orleans Counties intersects the south shore of Lake Ontario.” This point, the northernmost point on Lake Ontario’s southern shore, was designated on some maps as Thirty Mile Point, being thirty miles from the mouth of the Niagara River. 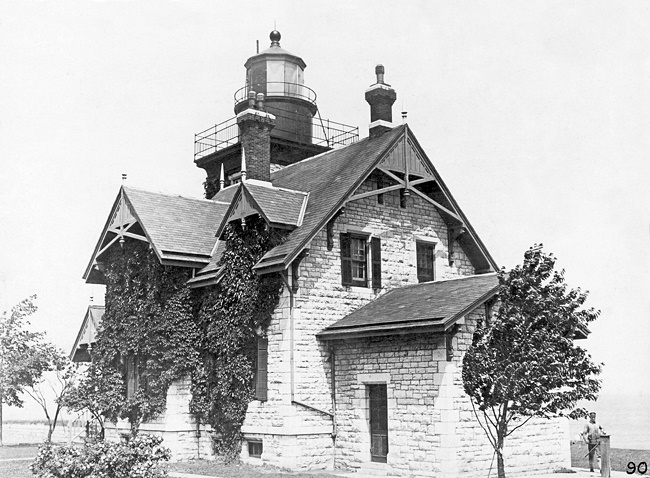 At that time, the first light east of the Niagara River was a newly erected fourth-order pier light at Oak Orchard, forty-five miles from the Niagara River. As this beacon was of little service to ships making for the Welland Canal, the Lighthouse Board requested $30,000 for a third-order light at Thirty Mile Point. On March 3, 1873, Congress appropriated the requested amount for the lighthouse, and later that year, two acres of land and a right of way to the nearby highway were purchased from Austin B. Hathaway, a local farmer, and his wife Mariah for $500. During 1874, plans for the lighthouse were prepared, cession of jurisdiction was obtained, an access road and bridge were constructed, and an additional $5,000 was requested. The supplemental amount was obtained on March 3rd, 1875, and ground was broken for the lighthouse shortly thereafter on April 28. Bad weather that spring caused much delay in the work, postponing the completion of the tower and dwelling to the following January. 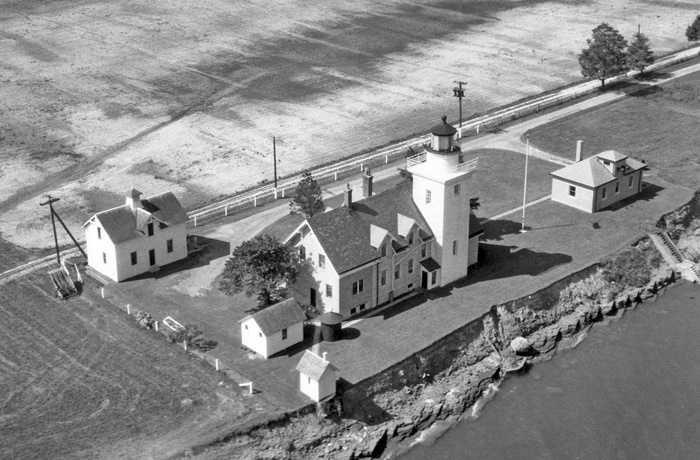 Lighthouse circa 1955. The tower was painted white by 1924 to improve its visibility from the lake. 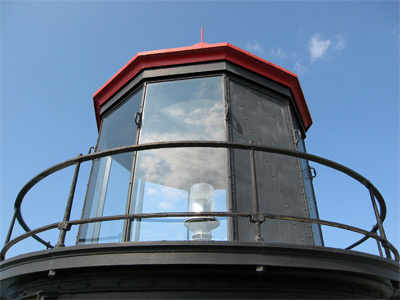 The light from the tower’s six-panel, third-order Fresnel lens, which cost just over $3,000 and was manufactured in France by L. Sautter and Company, was first exhibited on April 27, 1876. The lens initially revolved on eight, five-inch chariot wheels to produce a white flash every ninety seconds. After the lens was rebuilt in 1909, it was supported by ball bearings and revolved once per minute, creating a flash every ten seconds. The two-story, seven-room dwelling and attached seventy-foot-tall, square tower were built in a High Victorian Gothic style using natural faced limestone blocks quarried by Dewey and Phelps near Chaumont Bay at the eastern end of Lake Ontario. Decorative smooth limestone quoining is found at the corners of the lighthouse. Originally, the gables sported decorative panels, trim, and finials, but these were later removed along with the ornate chimney caps. Edwin Pratt served as the first head keeper of Thirty Mile Point Lighthouse, but just two years after his appointment, Hiram Vaughn, his assistant, made charges against him that led to his dismissal. Samuel Penfield took charge of the light in 1878 in place of Pratt, and four years later, local military veterans had a resolution printed in a few papers claiming that Collector Benjamin Flagler had unjustly appointed Penfield, “who never was a soldier, who had no previous knowledge of the duties required, and who was a comparative stranger in the vicinity” instead of promoting the Civil War veteran HiramVaughn, who still carried a one-ounce ball lodged in his thigh bone from the war. The resolution also claimed that Penfield deprived Vaughn of “his social privileges,” including the opportunity to attend his Post meetings. Collector Flagler responded to the claims by noting that when Vaughn had made the charges against Pratt, he had stated that should Pratt be removed, he didn’t want the position of head keeper because it would appear that he made the charges to secure his own advancement. Samuel Penfield survived the allegations and continued to serve as head keeper until 1888, when he was transferred to Ogdensburg Lighthouse. Vaughn left the lighthouse service in 1884. Soon after completion of the lighthouse, shoreline erosion became a serious concern. In 1877, the Lighthouse Board reported that the lighthouse lot was rapidly being worn away by wave action and recommended that a series of jetties be constructed perpendicular to the shore to retard the erosion, which otherwise might reach the tower and dwelling in a few years. Congress appropriated $5,000 in 1878 and 1880 for protecting the site. Though the work was deemed “of immediate necessity” in 1877, there was little erosion in 1880 and 1881, and, when bids to build a protective stone wall were finally invited in 1889, they were rejected as being excessive. A landing pier was built in front of the station in 1903 or 1904, but whether this was part of the erosion control is not known. In 1954, large boulders were placed along the shoreline to protect the lighthouse property. The light, originally fueled by lard oil, was converted to mineral oil (kerosene) in 1881. 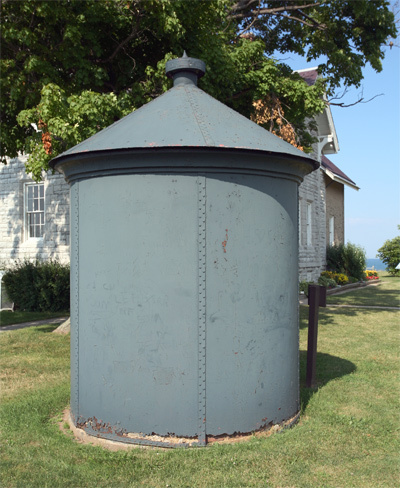 To store this more volatile liquid, a circular, metal oil house, capable of storing 225 gallons, was erected at the station in 1891. A second oil house, transferred from another station, arrived in 1910. The barn at the station dates from 1904. 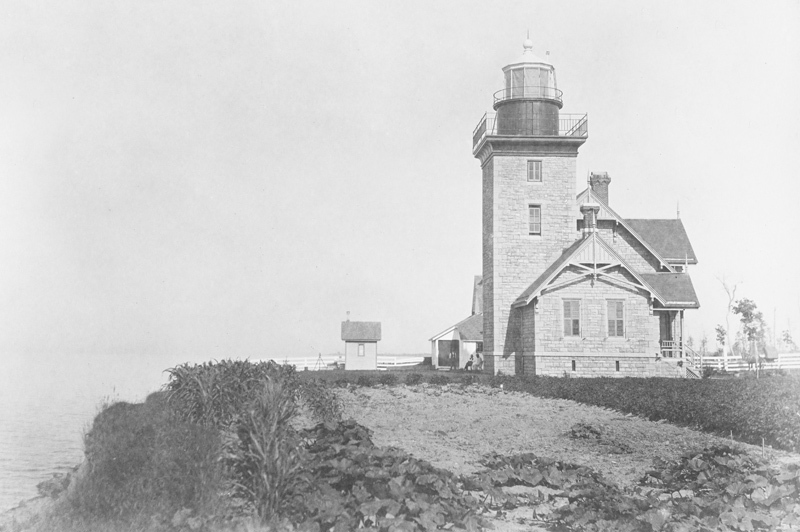 Shipping interests petitioned for a fog signal at Thirty Mile Point as early as 1908, but the Lighthouse Service didn’t request funds for its construction until 1921. Alterations had been made to the keepers’dwelling in 1884 so that the rooms for the two keepers were separated, but the Lighthouse Service asked that the dwelling be enlarged or a second one built when the fog signal building was erected. In 1934, the Delavan Construction Corporation of Buffalo was contracted to build a yellow-brick foghorn building and an addition to the east end of the dwelling. 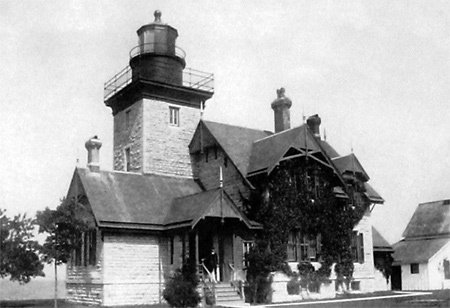 Municipal electricity was extended to the station at this time, allowing a 500-watt light bulb to replace the kerosene lamp being used inside the Fresnel lens and a thirty-two- horsepower electric motor to power the air compressor that energized the diaphone horns protruding from the north side of the fog signal building. Concrete shore protection was also added to the station during the construction of the fog signal building. Glenn Seeley spent a good portion of his life at Thirty Mile Point, arriving as an assistant keeper in 1903 and serving as head keeper from 1907 until his retirement in 1945. Four children were born to Seeley and his wife Cora at the lighthouse, where they also had the misfortune of holding funerals for two of their children. Twenty-eight-year-old Kenneth Seeley died in 1937, when a wheel came off his car and he plunged through a fence. Following the death of their daughter Esther in 1929, the Seeleys raised their infant granddaughter Beverly at the lighthouse for fifteen years before leaving the station. My grandfather white washed the lighthouse once each year. 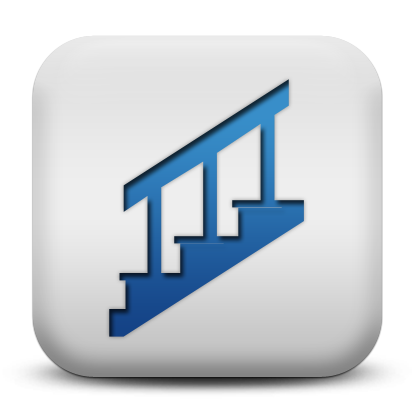 I always climbed the stairs to the light with him each night. My grandmother had a large cement fish pond with big goldfish in it. This was delightful in the summer. During my childhood the pier in front of the fog horn was built. This brought many construction people which was an exciting time for us. The majority of the time there was no one around except the summer. On Sunday in the summer a few visitors would come to go up in the lighthouse. 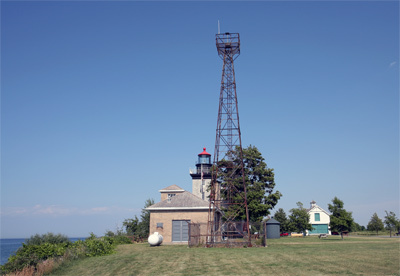 In 1958, an automated 300mm beacon was mounted atop a metal skeletal tower near the fog signal building, and Coast Guard personnel were removed from the station. 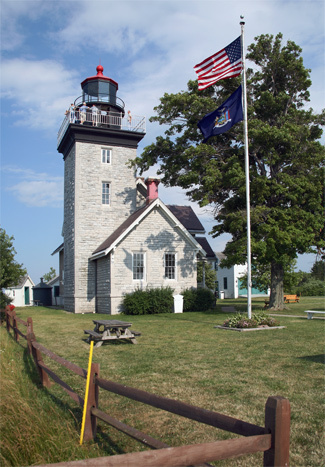 New York State began acquiring acreage around the lighthouse in the 1950s, and in 1962, 378-acre Golden Hill State Park was created. 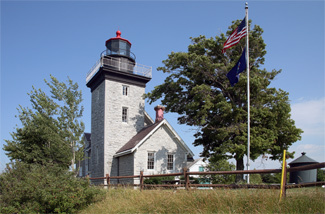 The lighthouse was transferred from the Coast Guard to the New York State Office of Parks, Recreation, and Historic Preservation in 1984. The U.S. 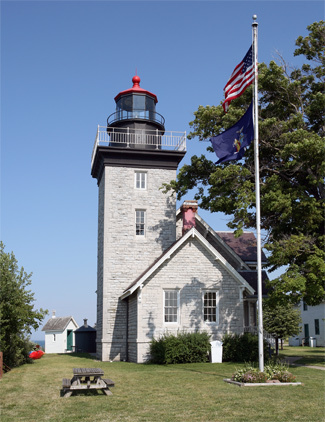 Postal Service selected Thirty Mile Point Lighthouse to represent Lake Ontario in a set of five stamps covering the lighthouses of the Great Lakes that was issued in 1995. 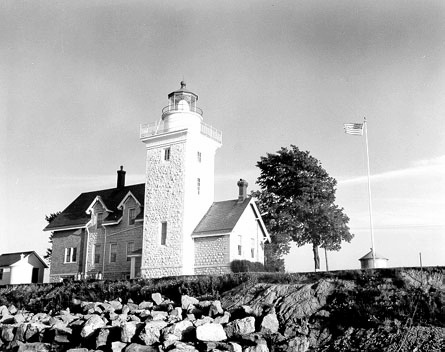 That same year, the non-profit group Friends of Thirty Mile Point Lighthouse was formed and held a celebration day at the lighthouse attended by over 5,000 visitors. With help from Tom Harris, manager of Golden Hill State Park, and a grant or two, the lighthouse’s slate roof, windows, and interior wiring were replaced, the exterior trim was painted, and the beautiful oak floors were refinished. On July 11, 1998, forty years after the historic Fresnel lens was removed, a new beacon was activated in the lantern room. Starting in 2001, the second story of the dwelling has been rented for week-long stays in the summer or shorter visits during the rest of the year. Today’s lighthouse residents are not asked to mind the light or perform other tasks required of the lighthouse keepers, but they do get a small glimpse into what life was like for a keeper along this isolated stretch of Lake Ontario. Head: Edwin D. Pratt (1876 – 1878), Samuel A. Penfield (1878 – 1887), Robert J. Bannerman (1887), Samuel A. Penfield (1887 – 1888), Robert J. Bannerman (1888 – 1907), Glenn R. Seeley (1907 – 1945), Carl A. Sprague (1945 – 1951), Harry L. Klein (1951 – 1954), Osgar K. Elmer (1954 – 1957), Frank Kubiak (1957 – 1958), Richard Prange (1958). 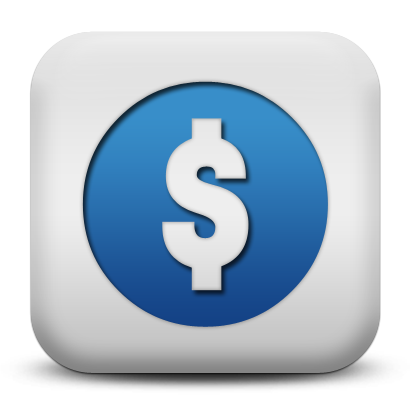 Assistant: Hiram A. Vaughn (1876 – 1883), David H. Montonna (1884 – 1885), Robert J. Bannerman (1885 – 1887), Rufus M. Powell (1888 – 1889), Selmer E. Armstrong (1889 – 1899), Charles G. Watson (1899 – 1900), Charles F. Chapman (1901), Charles A. Hunter (1901 – 1903), Samuel W. Long (1903), Vrooman H. Putnam (1903), Miles A. Wilkinson (1903), Glenn R. Seeley (1903 – 1907), Charles R. Thiele (1907), Daniel D. Hill (1907 – 1909), Lawrence Bernard (1909 – 1928), Arthur G. Shaw (1928 – 1938), William J. Oehser (1939 – 1947), Osgar K. Elmer (1947 – 1954), Edward C. Turell (1955 – 1956), Gale Daugherty (1956 – 1957), John Kildea (1957 – 1958). 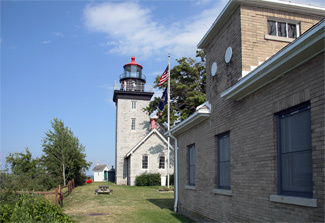 “30 Mile Point Lighthouse,” pamphlet, 2007. 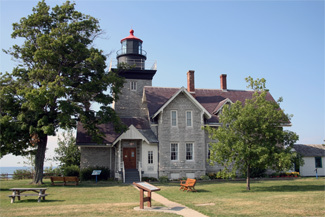 Located thirty miles east of the Niagara River on the shore of Lake Ontario in Golden Hill State Park. 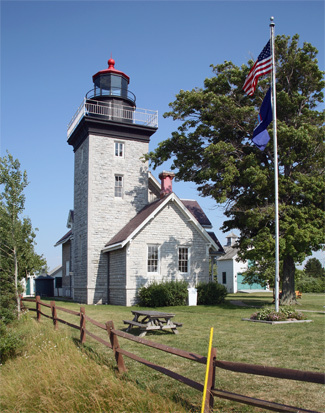 For a larger map of Thirty Mile Point Lighthouse, click the lighthouse in the above map. 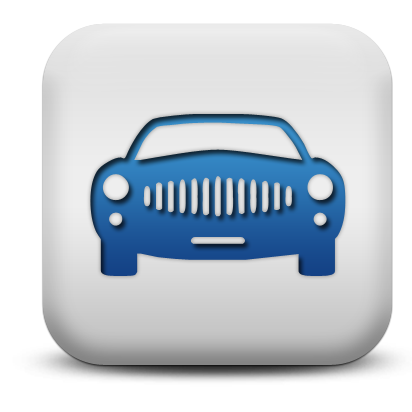 From Highway 18, three miles east of Somerset, go north on Carmen Road for 1.3 miles. Turn right on Lower Lake Road and then turn left into Golden Hill State Park. There are two roads into the park. You want the one with the campgrounds, not the marina. Follow the road into the park, pay the entrance fee, and then continue to the lake where you will see the Thirty Mile Point Lighthouse. 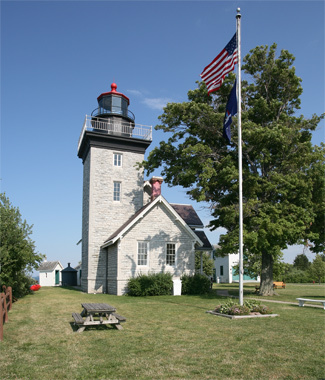 Thirty Mile Point Lighthouse can be rented for overnight stays by clicking here or by calling (800) 456-2267. 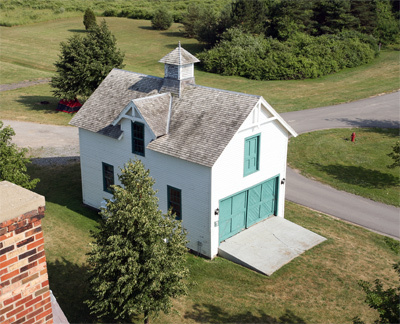 The lighthouse is open daily for tours from mid-May through mid-October. 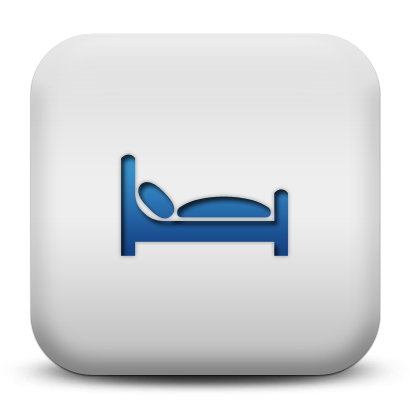 Hours are: Wednesday to Sunday from 9 a.m. to 5:30 p.m. and Monday to Tuesday from 2 p.m. to 4 p.m. Call the park at (716) 795-3885 to confirm hours or for more information. 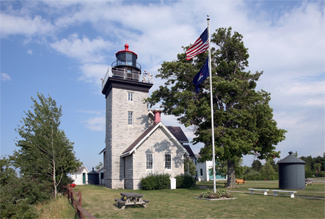 The lighthouse is owned by New York State Parks. 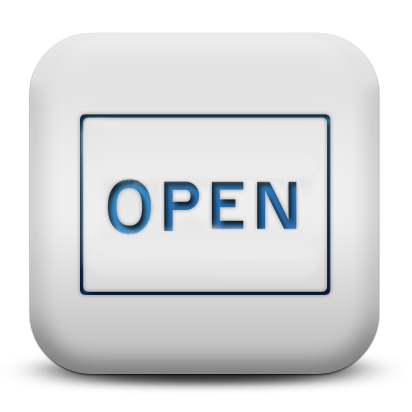 Grounds open, dwelling/tower open to tours and overnight guests.